Do you need a new or updated Child ID card for your children? If so, join PACT (Police and Community Together) at the City of Ridgecrest Lobby at 100 W California Ave, Ridgecrest, Ca on Monday, 11/19/18 from 9:00 pm to 11:00 pm. PACT is a non-profit organization, so all donations are welcome. 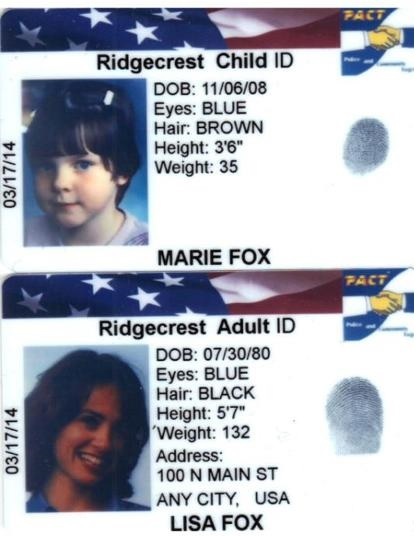 These donations help pay for supplies needed to keep the Child ID program running. Thank you in advance. If anyone has questions or needs more information, feel free to contact Ridgecrest Police Department at 760-499-5107, or send a FB message to the P.A.C.T. (Police And Community Together) facebook<https://www.facebook.com/ridgecrestpact/> page. Thank you. If so, join PACT (Police and Community Together) at the City of Ridgecrest Lobby at 100 W California Ave, Ridgecrest, Ca on Monday, 6/11/18 from 3:00 pm to 4:30 pm. If so, join PACT (Police and Community Together) at the City of Ridgecrest Lobby at 100 W California Ave, Ridgecrest, Ca on Monday, 4/9/18 from 3:00 pm to 4:30 pm. If so, join PACT (Police and Community Together) at the City of Ridgecrest Lobby at 100 W California Ave, Ridgecrest, Ca on Monday, 3/12/18 from 3:00 pm to 5:00 pm. If so, join PACT (Police and Community Together) at the City of Ridgecrest Lobby at 100 W California Ave, Ridgecrest, Ca on Monday, 2/12/18 from 3:00 pm to 5:00 pm. If anyone has questions or needs more information, feel free to contact Ridgecrest Police Department at 760-499-5107, or send a FB message to the P.A.C.T. (Police And Community Together) facebook page. Thank you.